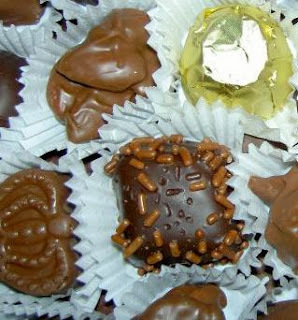 There are many ingredients used to make a multitude of various homemade candies. However, there are specific ingredients that are considered essential to almost every type of candy. Sugar, is considered by most candy makers as the base ingredient of candy and is at the core of just about every recipe. No matter if you are making caramels or peanut clusters, sugar or sweeteners are the deciding factors. When tasting sweets, the sweetness of the candy is at the forefront and most prominent of peoples taste buds. There are two main types of sweeteners: solid sweeteners and liquid sweeteners. Solid sweeteners include fine granulated sugar, powdered sugar, brown sugar, etc. Examples of liquid sweeteners include corn syrup and honey. The recipe will specify which sweetener is required for each particular candy. If you are just a beginner I suggest not substituting sweeteners from the recipe. If a recipe instructs to use an ingredient such as "cream" you can be assured it is a "dairy candy." These type of candies depend heavily on the both the texture and taste of the cream to delight your taste buds. Other dairy-based ingredients often used in making types of candies include: evaporated milk, butter, and condensed milk. Some recipes may alternately call for using the sweetened version of these respective dairy ingredients. Nuts are associated with their rich texture and flavor properties and are a real taste enhancer. Nuts usually are often at the center core of the candy. Nuts have a distinct flavor and most people have a preference as to their particular favorite type. The most popular types of nuts used for making candy are: almonds, macadamia, pecans and cashew nuts. The crunchy attributes of nuts add to the overall delight of the candy as well. Quite possibly the most popular ingredient on the planet, chocolate holds a pronounced position in the candy- making universe. The flavorful, yet delicate, properties of chocolate along with it's nutrients make this a staple ingredient for candy making. When looking to buy chocolate, there are two components that you should keep in mind: the range of the chocolate and the quality. The range of the chocolate is referring to the different versions of the original cocoa-derived product. As an example, you have white chocolate, dark chocolate and mid-range chocolates. Quality is referring to the natural butter content of the chocolate. A high quality chocolate will easily melt in your hands from its high butter content.